A few weeks ago, I suggested property values in Rugby would be between 0.9% and 1.9% different by the end of the year. It might surprise some people that Brexit hasn’t had an effect on the Rugby property market that most feared at the start of 2018. In that 2008 to 2010 property Credit Crunch recession, the average number of properties sold in the Rugby area were 109 per month. Interesting when we compare that to the boom years of 2014 to 2017, when an average of 159 properties changed hands monthly … yet in the ‘supposed’ doom laden year of 2018, an impressive average of 147 properties changed hands monthly … meaning 2018 compared to the boom years of 2014 to 2017 saw a drop of 8.1% – yet still 34.6% higher than the Credit Crunch years of 2008 to 2010. The simple fact is the fundamental problems of the Rugby property market are that there haven’t been enough new homes being built since the 1980’s (and I don’t say that lightly with all the new homes sites dotted around the locality). Also, the cost of buying your first home remaining relatively high compared to wages and to add insult to injury, all those issues are armor-plated by the tougher mortgage rules which were introduced in 2014 and the current mortgage market conditions. It is these issues which will ultimately determine and form the rather unexciting, yet still vital, long term outlook for the Rugby (and national) housing market, as I feel the Brexit issue over the last few years has been the ‘current passing diversion’ for us to worry about. Assuming something can be sorted with Brexit, in the long term property values in Rugby will be constrained by earnings increases with long term house price rises of no more than 2.5% to 4% a year. As a Rugby homebuyer, one shouldn’t be thinking of what is happening in Westminster, Brussels, Irish Backstop, China or Trump and more of your own personal circumstances. Do you want to move to get your child in ‘that’ school or do you need an extra bedroom for your third child? For lots of people, the response is a resounding yes – and in fact, I feel many people have held back, so once we know what is finally happening with Brexit and the future of it, there could a be a release of that pent-up demand to move home as people humbly just want to get on with their lives. Rugby Landlords? Well, where else are you going to invest your money? Like I said earlier in the article, we aren’t building enough homes to keep up with demand … so as demand outstrips supply, house values will continue to grow. Putting the money in the building society will only get you 1% to 2% if you are lucky. In the short term though, there could be some bargains to be had from shortsighted panicking sellers and in the long term … well, the same reasons I gave to homeowners also apply to you. With the Government preparing to control tenant’s deposits at five weeks rent, Rugby landlords will soon only be protected in the event of a single month of unpaid rental-arrears, at a time when Universal Credit has seen some rent arrears quadrupling and that’s before you consider damage to the property or solicitor costs. It can’t be disputed that the deposits Rugby tenants have to save for, certainly raises the cost of renting, putting another nail in the coffin of the dream of home ownership for many Rugby renters whilst at the same time, those same deposits being unable to provide Rugby landlords with a decent level of protection against unpaid rent or damage to the property. When you consider the value of all the privately rented properties in Rugby total £1,259,744,382, the need for decent landlord insurance to ensure you are adequately covered as a Rugby landlord is vital. However, I want to consider the point of view of the Rugby tenant. Several housing charities believe spending more than a third of someone’s salary on rent as exorbitant, yet for the tenants they find themselves in that very position. I feel especially sorry for the Rugby youngsters in their 20’s who want to rent a place for themselves, as they face having to pay out the rent and try and save for a deposit for a home. ….and 40% of their salary for a 2-bed home in Rugby. Yet landlords also face costs that need to be covered from rents including mortgages, landlord insurance (especially the need for the often-inadequate deposits to cover the loss of rent and damage), maintenance and licensing. In fact, rents in the last 10 years have failed to keep up with UK inflation, so in real terms, landlords are worse off when it comes to their rental returns (although they have gained on the increase in Rugby property values – but that is only realised when a property sells). There are a small handful of Rugby landlords selling some/or all of their rental portfolio as their portfolios become less economically viable with the recent tax changes for buy to let landlords, which will result in fewer properties available to rent. However, this will reduce the supply and availability of Rugby rental properties, meaning rents will rise (classic textbook supply and demand), thus landlords return and yields will rise. Yet, because tenants still can’t afford to save the deposit for a home (as we discussed above) and we are all living longer, the demand for rental properties across Rugby will continue to grow in the next twenty to thirty years as we turn to more European ways where the norm is to rent rather than buy in the 20’s and 30’s age range. This will mean new buy-to-let landlords will be attracted into the market, buy properties for the rental market in Rugby and enjoy those higher yields and returns … isn’t it interesting that things mostly always go full circle? Over the last 5 years, we have seen some interesting subtle changes to the Rugby property market as buying patterns of landlords have changed ever so slightly. Looking closer to home in Rugby, throughout 2018, I have been regularly chatting to more and more landlords, be they seasoned professional Rugby BTL landlords or FTL’s (first time landlords) and their attitude is mostly positive. Instead of reading the scare-papers (oops sorry newspapers), those Rugby landlords that look with their eyes, will see the Rugby property market is doing reasonably well, with medium term rents and property values rising; as quite obviously from the mortgage figures .. landlords are still buying. 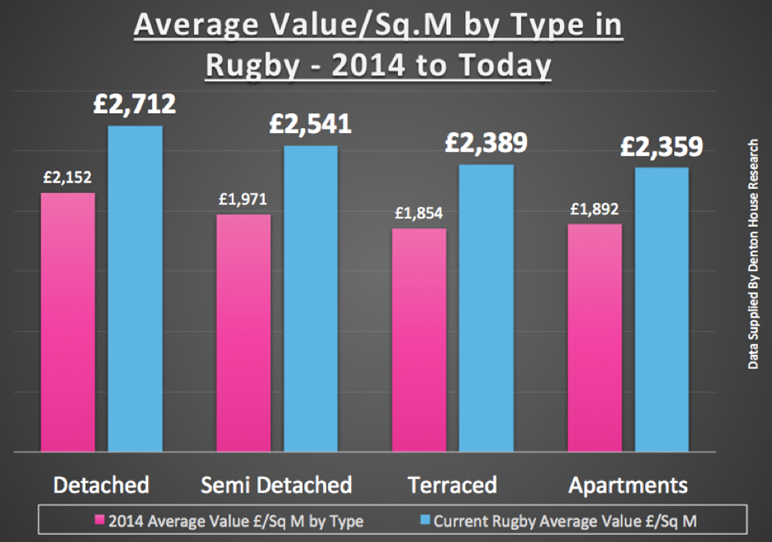 Since 2014, property values in Rugby have risen by 27.5%. This has proved that semis and terraced houses have performed the best .. although like the £/Sq.M figures, these are just averages. When investing, whilst Rugby apartments haven’t been the best performers in terms of capital growth, they do tend to generate a slightly better yield than houses, probably because several sharers can afford to pay more than a single family. But houses tend to appreciate in value more rapidly and may well be easier to sell, simply because there are fewer being built. Now these are of course averages, but it gives you a good place to start from. The bigger picture here though is this – irrespective of what is happening in the world, be it Brexit/no Brexit, China, Trump, whatever, Rugby people still need a roof over their heads and we as a Country haven’t built enough homes to keep up with the demand since the late 1980’s. This means even if we have a short term wobble in 2019 when it comes to property values ..in the medium term, demand will always outstrip supply and prices and rents will increase – because, I doubt the local authority, let alone Westminster, have the billions of pounds required to build the one hundred thousand Council houses per year nationally for the next decade to fix this issue – meaning as the population increases, the only people who can fulfil the demand for accommodation in the medium term is the private BTL landlord. In todays Rugby property market, the Rugby homeowners and Rugby landlords I talk to are always asking me which attributes and features are likely to make their property comparatively more attractive and which ones may detract from the price. Over time buyers’ and tenants’ wants and needs have changed. In Rugby, location is still the No. 1 factor affecting the value of property, and a property in the best neighbourhoods can achieve a price almost 50% higher than a similar house in an ‘average’ area. Nevertheless, after location, the next characteristic that has a significant influence on the desirability, and thus price, of property is the number of bedrooms and the type (i.e. Detached/Semi/Terraced/Flat). The number of bedrooms for owner-occupiers very much depends on the size of the family and the budget, whilst Rugby landlords have to consider the investment opportunity. 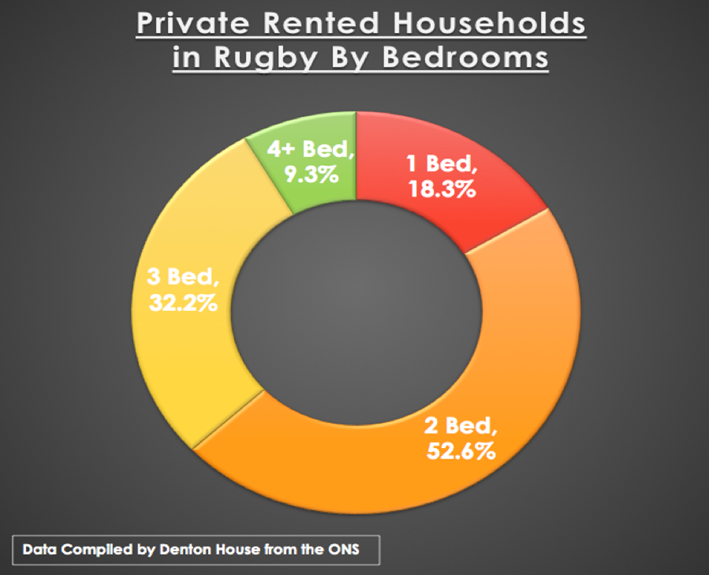 In this article, I have analysed Rugby’s housing stock into bedrooms and tenure. Initially looking at Rugby homeowners.. 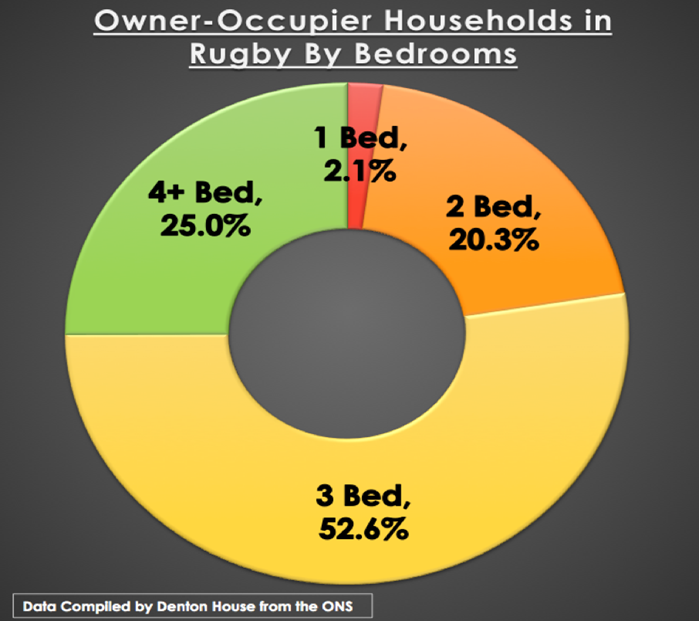 It can quite clearly be seen that Rugby owner-occupiers tend to occupy the largerproperties with more bedrooms. This would be expected due to the demographic of homeowners and people that privately rent. However, this shows there could be opportunities for Rugby buy to let landlords to purchase larger properties with more bedrooms to attract tenants requiring properties with more bedrooms. However, before you all go buying larger 4 bed and 5 bed mansions to rent them out, a lot of bigger properties in Rugby don’t make financial sense when it comes to buy to let. You read the personal finance pages of the newspapers and it all seems to be the impending pensions crisis … where people aren’t saving enough for their retirement. But it’s not the lack of Rugby peoples’ future pension incomes that are my immediate concern. The fact is that so many of the future retirees in Rugby over the coming decade, who never bought their home in the Millennial years of the 1990’s and 2000’s, will have to make some tough decisions regarding what house they live in when they retire anytime between now and 2038. 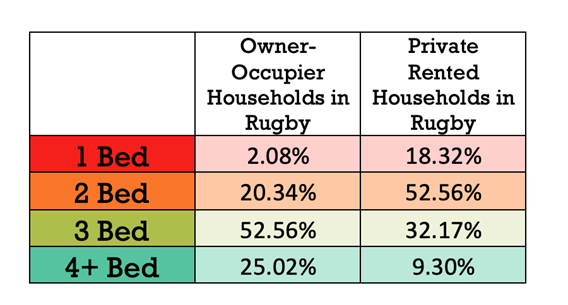 In Rugby, there are 653 privately rented households, where the head of the household is between 50 years and 64 years of age (meaning they will be retiring anytime between now and 2038). They are working now and easily paying the rent, yet what happens when they retire? It is most people’s opinion that retirees are either council tenants or own their home outright. Looking at these figures though, it looks like both these ‘mature’ private renters could be having to make some decisions on their lifestyle and where they live, possibly looking at downsizing the home they rent to make things more affordable in their old age. Also, the government will be in for a horrible surprise as more of Rugby people retire and continue to rent from a private landlord. Numerous Rugby private renters, with little or no savings, will have to rely on Housing Benefit, which will put greater pressure on the public purse. What does this mean for mature Rugby homeowners? I see many using equity release schemes to stay in their homes to pay for a better retirement and others more open to downsizing, selling their large home to a family that needs it and moving into a smaller apartment or bungalow … yet lets be frank – they aren’t building bungalows in large numbers in Rugby anymore. And for the Rugby landlords? Well with the younger Millennials showing no appetite in jumping onto the homeownership bandwagon anytime soon, it can only result in the demands on the buy to let market from Rugby tenants rising substantially. Of course, many Millennials will inherit money from their home owning parents in the coming few decades, yet a lot won’t as it will be spent on nursing home care and any leftovers (if any) split between siblings. The solution to all this is to build more homes, of course. Last year we created/built just over 217,000 households in the UK, up from a post Millennial average of just under 150,000 households a year. We need to get back to the building booms of the late 1960’s and early 1970’s when on average 300,000 households were built … but back to reality … that won’t happen so it looks like we are turning into a nation of renters, which is of course good news for Rugby’s buy to let landlords! 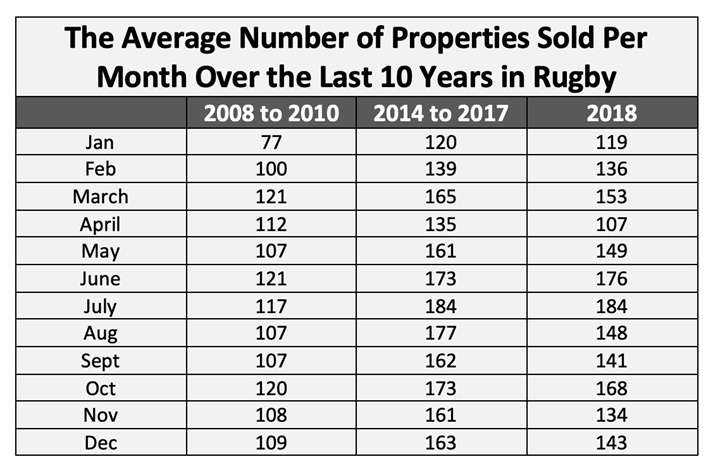 As we go full steam ahead into 2019, it’s certain that the Rugby housing market in 2018 was a little more restrained than 2016 and 2017 and I believe this will continue into 2019. Property ownership is a medium to long term investment so, looking at the long-term, the average Rugby homeowner, having owned their property since the Millennium, has seen its value rise by more than 226%. This is important, as house prices are a national obsession and tied into the health of the UK economy as a whole. The preponderance of that historical gain in Rugby property values has come from the growth in Rugby property values, while some of it will have been enhanced by extending, modernising or developing their Rugby home. 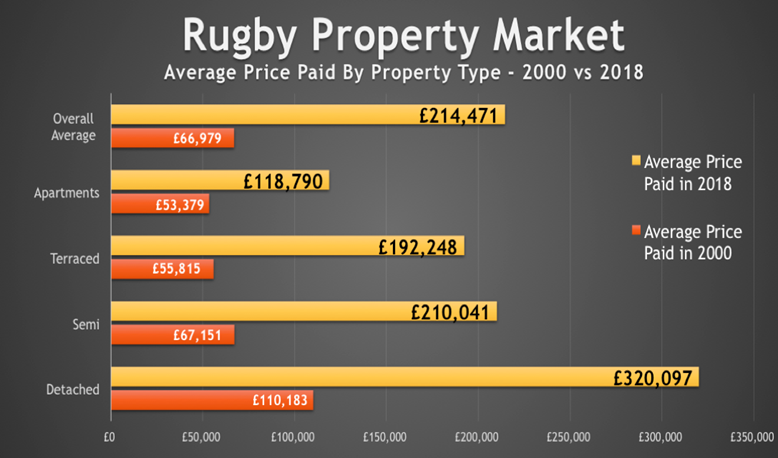 Taking a look at the different property types in Rugby, and the profit made by each type, makes interesting reading.. So the ‘real’ value of the profit, after inflation, in Rugby has been £5,002 per year.. still nothing to sniff at. I wanted to show you that even though we had the 2008/09 Credit Crunch property market crash where, depending on the type of Rugby property, property values dropped between 15% and 20% in 18 months … Rugby homeowners over the long term are still better off than those renting. Moving forward, the question I get asked time and again is what will happen in the future to the Rugby Property market? Irrespective of what is happening in the World, Europe or even Central London, the biggest factor over the medium to longterm to ensure that this level of house price growth is maintained in Rugby is the building of new homes both locally and in the country as a whole. Whilst we haven’t had the 2018 stats yet, Government sources suggest this will be nearer 180,000 to 190,000, a decrease from the 2017 figure of 217,350 new households being created. When you consider that we need to build 240,000 households to equal demand (immigration, people living longer, higher divorce rates and people co-habiting later in life etc) … demand will outstrip supply and unless the Government start to spend billions building council houses .. this trend will continue for years (and decades to come). Another factor is that whilst Rugby landlords have been hit with higher taxes to enable them to actually be a landlord most, in every national survey, still intends to increase their portfolio in the medium to long term. The youngsters of Rugby see renting as a choice, giving them flexibility and options that being tied to a home cannot give… thus meaning demand will continue to grow and landlords will be able to enjoy increased rents and capital growth, although those very same Rugby buy to let landlords will have to work smarter in the future to continue to make decent returns (profits) from their buy to let investments. 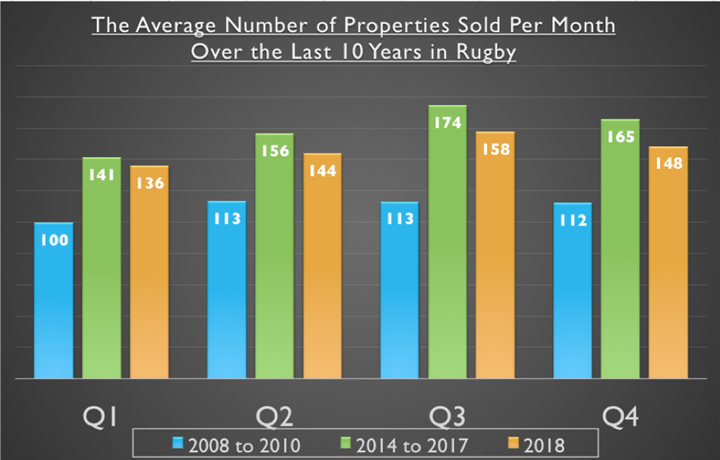 Even with the tempering of house price inflation in Rugby in 2018, most Rugby buy to let landlords (and homeowners) are still sitting on a copious amount of growth from previous years. The question is, how do you, as a Rugby buy to let landlord, ensure that continues? Since the 1990’s, making money from investing in buy to let property was as easy as falling off a log. Looking forward though, with all the changes in the tax regime and balance of power, making those similar levels of return in the future won’t be so easy. Over the last ten years, I have seen the role of the forward thinking agents evolve from a person collecting the rent to a more all-inclusive role; I call it, ‘strategic portfolio leadership’. Thankfully, along with myself, there are a handful of agents in Rugby whom I would consider exemplary at this landlord portfolio strategy where they can give you a balanced structured overview of your short, medium and long-term goals, in relation to your required return on investment, yield and capital growth requirements. If you would like such advice, speak with your current agent – whether you are a landlord of ours or not – without any cost or commitment, feel free to drop me a line. 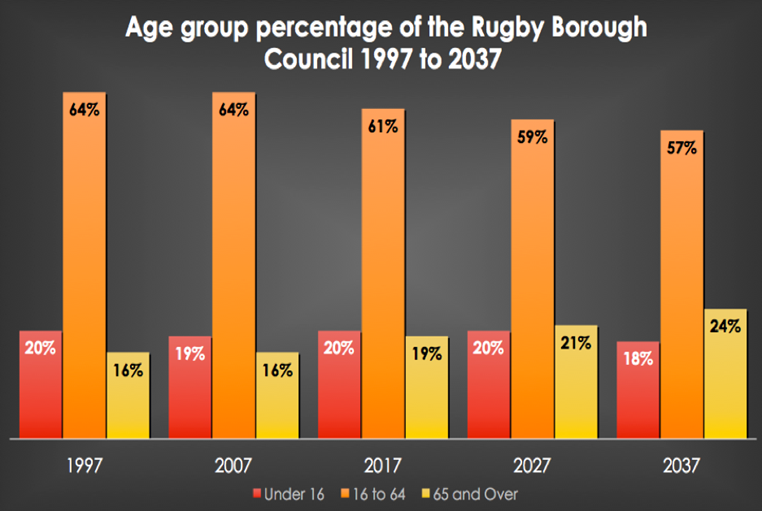 As OAP’s set to rise to 1 in 4 of Rugby’s population by 2037 – Where are they all going to live? With constant advances in technology, medicine and lifestyles, people in the Rugby area are, on average, living longer than they might have a few decades ago. As Rugby’s population ages, the problem of how the older generation are accommodated is starting to emerge. We, as a town, have to consider how we supply decent and appropriate accommodation for Rugby’s growing older generation’s accommodation needs while still offering a lifestyle that is both modern and desirable. In 1997 in Rugby, around one in every six people (16%) were aged 65 years and over (and the local authority area as a whole), increasing to nearly one in every five people (19%) in 2017 and it is projected to reach around one in every four people (24%) by 2037, meaning..
Over the next 19 years, the growth of the over 65 population in Rugby will grow by 26.3% – a lot more than the overall growth population of Rugby of 11.2% over the same time frame. In fact, the number of those over 90 is expected to more than double in our local authority from 1,125 (1.1%) in 2017 to 2,583 (2.2%) by 2037. Looking at Rugby and the local authority as a whole, there is a distinct under supply of bungalows and retirement living (i.e. sheltered) accommodation. The majority of sheltered accommodation fit for retirement is in the ex-local authority sector whilst the majority of private sector bungalows were built in the 1960s/70s/80s and are beginning to show their age (although that means there is often an opportunity for Rugby investors and Rugby buy to let landlords to buy a tired bungalow, do it up and flip it/rent it out). In the medium to longer term, we need to build more bungalows and sheltered accommodation and, if we do that, that won’t only be of benefit to the elderly population of Rugby – it will have a direct knock-on effect to the younger and middle-aged population by unlocking those family homes the older generation homeowners live in.